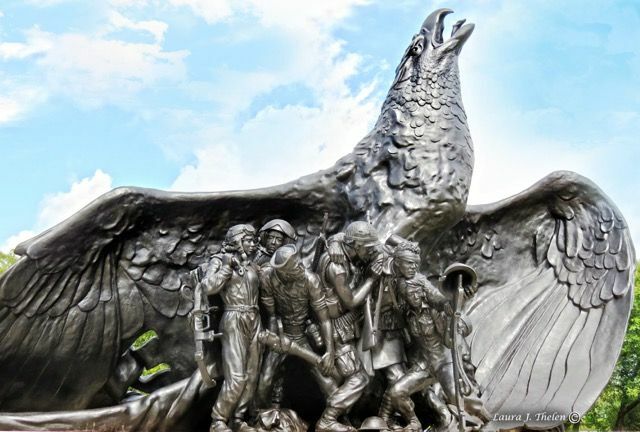 The Iron Range Veterans Memorial in Virginia is a nine-ton bronze statue 16 feet tall and 21 feet long, consisting of nine life-sized figures representing all the wars from WWI to the Persian Gulf. 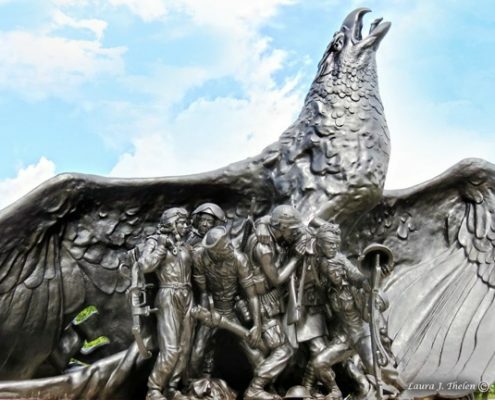 They stand in front of an eagle with wings outstretched and head thrown back and mouth open either in agony or victory depending on the moment. 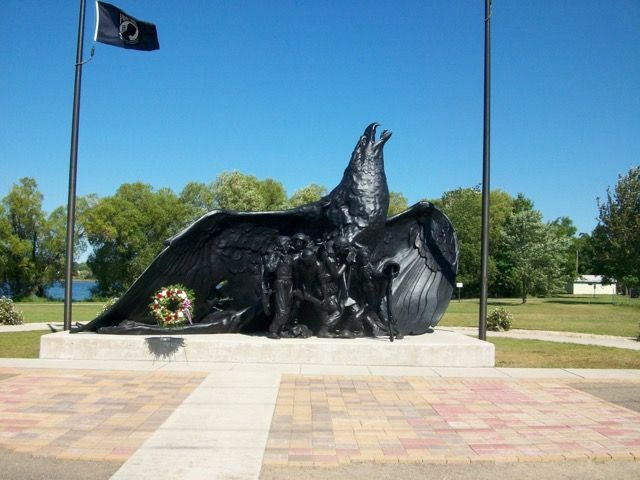 This statue was commissioned to honor all veterans from the Iron Range area of Northeastern Minnesota. It cost approximately $1 million, an amount raised over more than 14 years of fundraising with mostly private donations. In front of the sculpture are black granite markers approximately four feet tall commemorating each of the wars. 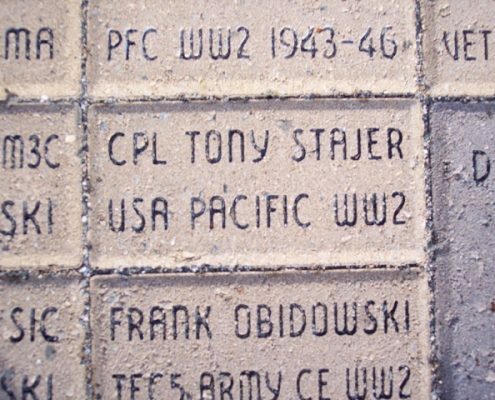 Also in front of the sculpture embedded in the ground are approximately 1,100 engraved pavers honoring individual veterans. 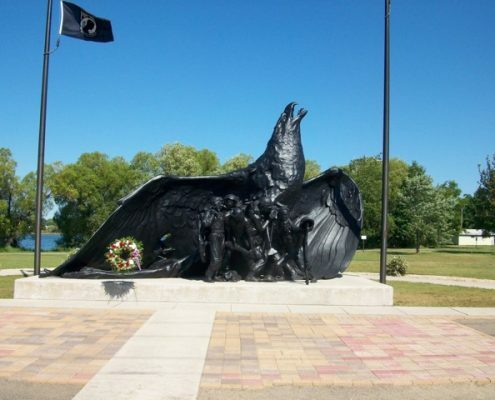 Next to the walkway leading to the statue is one final black granite marker explaining what each figure is and what war they represent in the words of the sculptor, a local Iron Range man named Gareth Andrews. The Iron Range Veterans Memorial is located in City Central Park in Virginia, on the corner of Fourth Avenue and Second Street North. 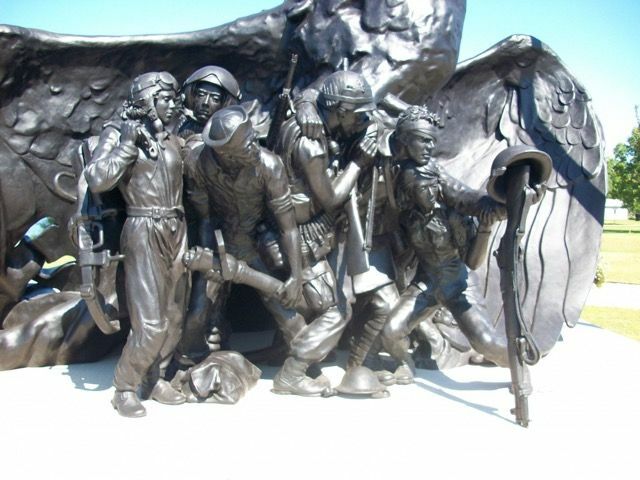 “Shoulder to Shoulder: Even the Fallen Stand Tall” was designed and executed by renown artist Gareth Andrews. It is cast in bronze. The Crucible Foundry in Norman, OK, cast the 160 pieces of the sculpture and assembled it. The Iron Range Veterans Memorial project began in 1998. The statue was installed in 2012. Iron Range Veterans Memorial committee contact: 218-749-5362 or 218-749-3751. 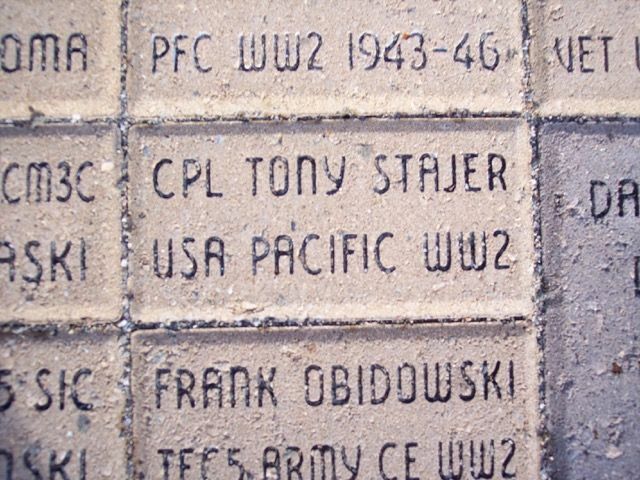 To purchase a memorial brick paver, available in three sizes, call 218-744-3952 or 218-744-2140. Proceeds are used for upkeep of the memorial.